Labor Day is right around the corner, which means a relaxing day off work to celebrate the beautiful end-of-summer weather with friends and family. No day off is complete without a cold drink, fresh fruit and food off grill. Here are three new pineapple ideas to try out for your Labor Day party. Pineapple ice cubes give any drink a sweet, tropical flavor and look and are simple to make. These go great with our Perfect Pineapple Punch cocktail recipe or Simple Summertime Pineapple Lemonade. All you have to do for these is blend fresh pineapple chunks with 2 limes, zested and juiced. Blend until texture is smooth and pour into ice cube tray to freeze. This decorative pineapple palm tree adds a tropical and refreshing look for your labor-day party this year. You’ll need 3-4 pineapples, long skewer sticks, and fern leaves or palm leaves. Preparation can be done days before the party without the pineapple shell going bad. To start, hollow out the pineapples and cut into pieces. Hollowing out the pineapple can be done by cutting off the top and running a knife in a circle inside of the pineapple. Cut the inside core across twice, and scoop out pineapple with a spoon. Cut pineapple pieces and place into a zip lock bag for storage. 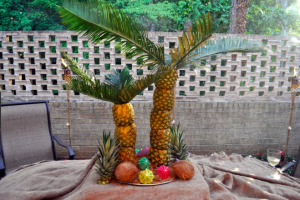 Then, place the hollowed pineapples on top of each other and hold in place with skewers. Insert leaves on the top and place fruit all around for a beautiful display. For help on how to find your perfect ripe pineapples, click here. 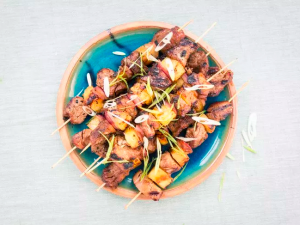 These Hawaiian skewers are easy and delicious bites to enjoy for your labor-day get together. Looking for something a little easier? Check out an older recipe for Holday Party Skewers with Ham, Pineapple & Mozarella. In a medium bowl, toss the pork with 1 cup of the teriyaki sauce and then refrigerate for at least 2 hours. Light a grill. Thread pieces of pork with pieces of pineapple and onion onto wooden skewers, and then brush all the skewers with the olive oil. Grill the skewers, turning as needed and basting with remaining teriyaki sauce, until cooked through, 12 to 15 minutes. Transfer the skewers to a serving platter and let rest for 5 to 10 minutes. Sprinkle the skewers with scallions before serving. This entry was posted in Featured, Latest News, Recipes, Tips & Tall Tales. Bookmark the permalink.